Have you ever thought about what makes you trust a particular website? For me, there are many things. The look and feel of the website. The word choice used. Even the images displayed. Quickly building trust online with your website will increase the willingness of your acupuncture patients in choosing your practice over another. And while there are many ways to build trust with your website, today I'm going to talk about one that is becoming increasingly important. Computer security is a hot topic recently, especially, with the news of the Apple and FBI case. The result of this is that the general pubic will be more aware and knowledgeable about encryption. Which is a great thing! These days, when I browse to a website, the first thing I look for is the green lock icon and "https" in the address bar. This signals to me that the website and company understands and cares about the security of my data. I am especially sensitive about the green lock icon on websites I give credit card information to like Amazon or banks. And increasingly, I find myself uncomfortable around any website WITHOUT the green lock icon. What is the green lock icon? The green lock icon means that the website's identity has been verified by a third party. And, that a secure connection has been established between your browser and the website you're viewing. A secure connection means that the data is encrypted and no one except you and the website can see the information transferred. When you click on the green lock icon in your browser, you will get a popup with more details about your connection with the current website. 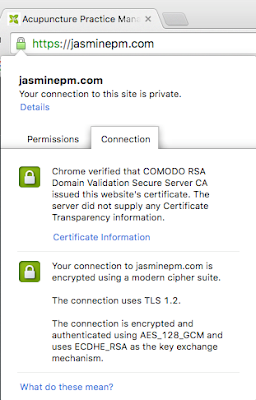 In the image above, the Chrome browser is telling us, that the website's domain was verified by the COMODO RSA Domain Validation Secure Service CA (Certificate Authority) and the connection is encrypted with TLS 1.2. 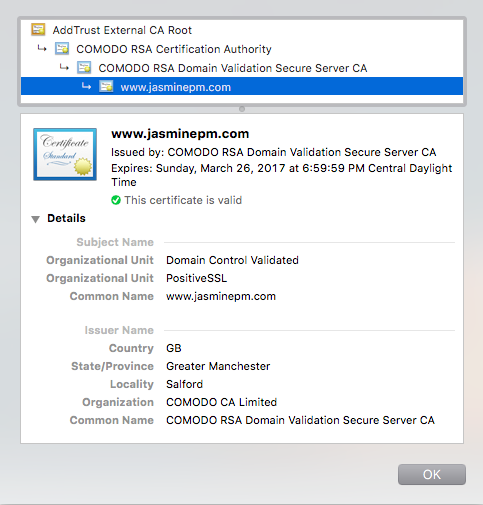 In the screenshot above, if you click on the "Certificate Information", you will see the website's certificate details, which is below. 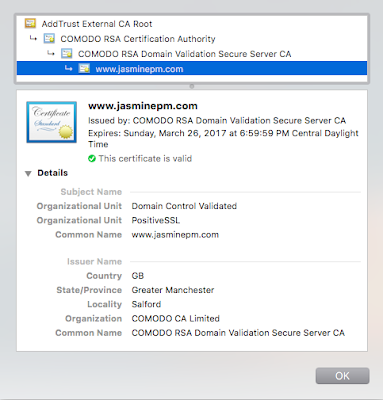 The important thing about the certificate details is the Certificate Authority. Certificate Authorities are trusted companies who are allowed to issue certificates. 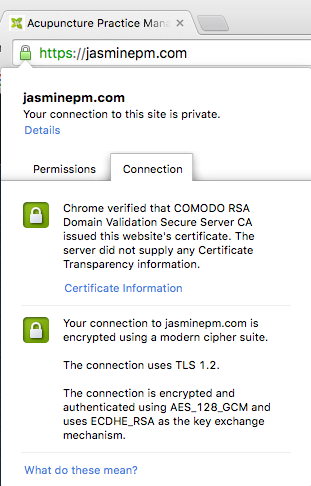 A certificate issued by an authorized Certificate Authority is what creates the green lock icon in the browser. It's green, locked and loaded! Let's go! The most inexpensive and hassle free certificate is what's called the Domain Validation certificate. Domain Validation means that the Certificate Authority verified that you are the owner of your domain. Many times this is done with an email or by putting a file on your website. Another way get a free certificate is to use a program called Let's Encrypt which was created by Mozilla and the Electronic Frontier Foundation. The purpose of Let's Encrypt is to create a more secure internet. Look into getting a certificate for your website domain. Gain trust with your patients. They'll love you for it! What Acupuncturists Can Learn From Donald Trump!